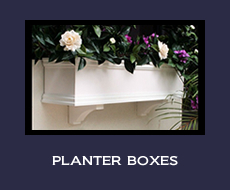 Fineline Millwork is a manufacturer and retailer of high quality exterior window shutters, decorative brackets and window planter boxes. 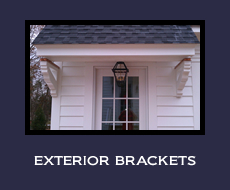 We specialize in making products that will add instant curb appeal and value to your home or business. All of our wood, composite and PVC products are made right here in the USA by skilled craftsmen and are guaranteed for the entire time you own your home. We offer free shipping anywhere in the 48 continental United States and have a very fast turn around time. In fact, most orders are made and leave our store within 7 days! We have experienced staff that is happily ready to help you before, during and after your purchase. 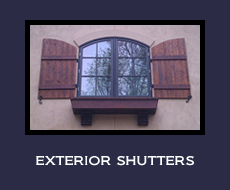 There are many different styles and types to choose from when purchasing exterior window shutters for your home. If you follow a few simple guidelines, the task will be much easier. What is the most common style in my neighborhood? Sometimes a quick drive through your neighborhood can help you decide if you want your outdoor shutters to blend in with all the others or, if your would rather have your home be the one that all the others envy. We have several very common styles of exterior window shutters including board and batten, raised panel and louvered that will fit in with most any neighborhood. We can also develop a custom design specific to your taste that will stand out from the crowd and gleam with a beautiful curb appeal. If you do not live in a neighborhood then you may want to research the type of shutters that originally went with your style of home. Keeping your style authentic often adds value to your home. Much like choosing the style of your exterior window shutters, choosing the type of material can be just as challenging. Here are a couple of things you can ask yourself to help determine what material is best for you. Will I paint or stain my new window shutters? Cedar is naturally weather resistant and most insects do not like it. Cedar can be sanded very smooth and absorbs finish paint exceptionally well. Composite is also weather resistant and is completely immune to insect damage. the greatest advantage in using composite is that it resists mildew and holds paint longer than wood. This typically adds several more years of use when compared to wood. Besides an occassional cleaning, composite is virtually maintenance free. PVC is by far and large the best choice for longevity. It does not need any finishing but can be painted if desired.It is insect and mildew resistant and never needs any maintenance other than the occasional cleaning. If you choose to stain your new house shutters then western red cedar or cypress is your best choice. Using a high quality stain with 3 coats of high quality, exterior polyurethane will give you an incredibly great looking finish that will last for many years. 2). We do not make promises we can't keep. If we say it will happen, you can rest assured that it will happen. 3). All of our products are guaranteed for the entire time you own your home! 4). We offer free shipping within the United States. 5). We offer full product finishing including stain and paint. 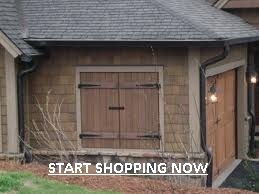 Adding exterior shutters to your home can provide instant curb appeal and add value to your home. There are many different styles to choose from as well as many different types of materials and finishes. Some people prefer the stained look while others prefer to leave their exterior window shutters completely natural. Many love to paint their shutters to match the trim on their home or even a different color to accent their home. Whatever the style or color, adding custom exterior window shutters will make a dramatic difference in the appearance of your home. Please give us a call if you have any questions or would like to place an order by phone.